Helps prevent formation of abnormal scars. Whether it be surgery, injury, burns, bites or acne, scars are often an unpleasant reminder of a nasty event you would rather forget. When they are exposed people can often bombard you with questions about how, where and when you had the scar which can leave people feeling self-conscious and force you to cover up to avoid the interrogation. If left alone there is little that can be done about a scar. Forscar Scar Recovery Gel works on both old and new scars to flatten, soften and smooths scar tissue to reduce the overall appearance of scarring to make them just about invisible with results seen from as little as 2 weeks. Forscar recovery gel is made with patented silicone technology and 5% antioxidant squalene. The patented technology helps flatten, soften and smooth scars by increasing hydration and temperature of stratum corneum (the outer most layer of skin). It forms a non-tacky, substantive and waterproof barrier which protects the scar from bacterial and chemical invasion which helps prevent bacteria-induced excessive collagen production in the scar tissue that causes the visible issues with scars. It also allows the skin to breathe which relieves itching and discomfort. The gel contains a unique ingredient that makes it better than any other scar treatment out there. Olive Oil Squalane has a unique antioxidant property contributes to the process of scar healing. It hydrates the scar by helping to prevent trans-epidermal water loss of the skin, through the promotion of an ideal environment throughout the scar healing process. 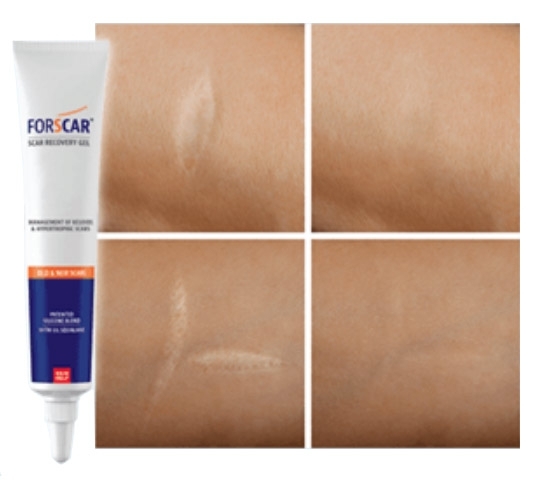 10ml May not seem like it is a lot however one tube of Forscar Scar Recovery Gel is enough for 90 days when using it twice a day on a scar that is around 5-7cm, more than enough to see amazing results on your scars.